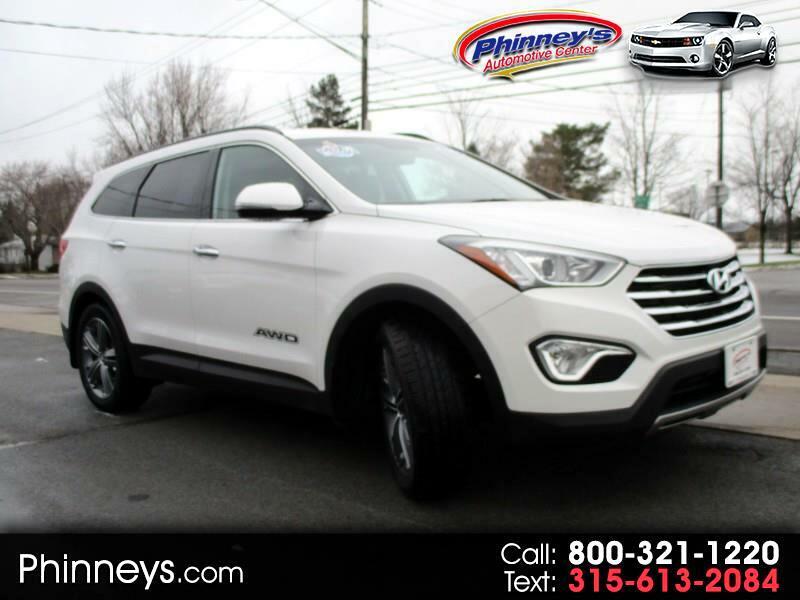 With a spacious interior, unparalleled cargo space, and easy maneuverability, our 2016 Hyundai Santa Fe XL Limited All Wheel Drive presented in Monaco White offers family-friendly luxury that is certainly going to exceed your expectations! Motivated by a potent 290hp 3.3 Liter V6 and a 6 Speed automatic transmission with Shiftronic, our incredible crossover delivers spirited acceleration, a smooth ride, 9.4 hwy l/100km, and tows up to 5,000lbs. Our Hyundai Santa Fe XL Limited exudes sporty sophistication with 19 inch alloy wheels, a rear spoiler, and chrome accents. You'll also appreciate roof rack side rails, trailer tow pre-wiring, and dual heated mirrors. A haven of comfort and refinement, the interior greets you with heated and cooled first row and heated second row seats and a 60/40-split third-row seat that offers versatile seating for seven. Settle into the supple leather seats, grip the heated steering wheel, and stay safely connected and in-the-know thanks to premium navigation, an AM/FM/SiriusXM/CD/MP3 touch screen audio system with iPod/USB/auxiliary input jacks and Bluetooth hands-free. Drive with confidence knowing your Santa Fe XL scored superior safety ratings thanks in part to innovative safety systems that help you avoid and manage challenging driving situations. Reward your family with the security, style, and space that only this masterfully crafted Santa Fe XL can deliver! Print this page and call us Now... We Know You Will Enjoy Your Test Drive Towards Ownership!